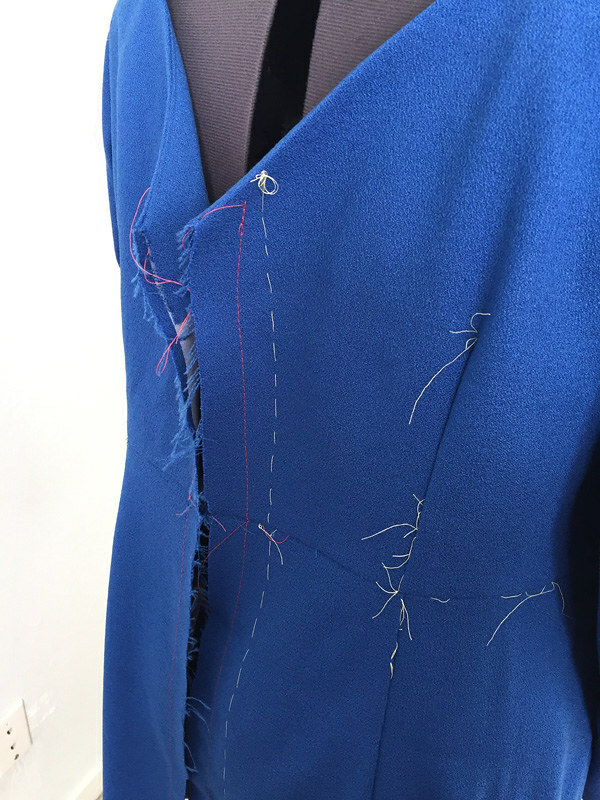 While I really like to get into some highly technical sewing project like a tailored jacket it does seem like most of my sewing time lately goes into fitting. Teaching aspects of fitting, writing about fitting, adjusting patterns and sewing up test garments. No matter how long you have been sewing, fitting is the ultimate challenge. It's something that never will be finished. Not as long as there is an interesting new pattern that I want to make, then there will be patterns that need adjustment and customization. 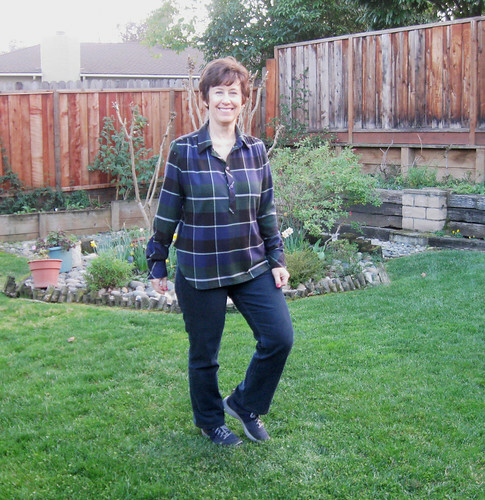 Speaking of fitting, I've had two blog Craftsy posts recently that you might like to check out. 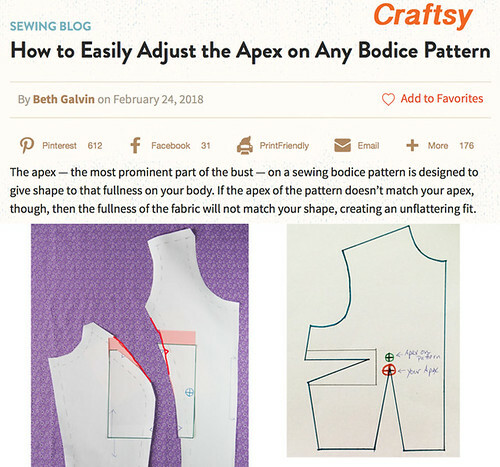 The first is How to adjust the Apex on any Bodice Pattern. 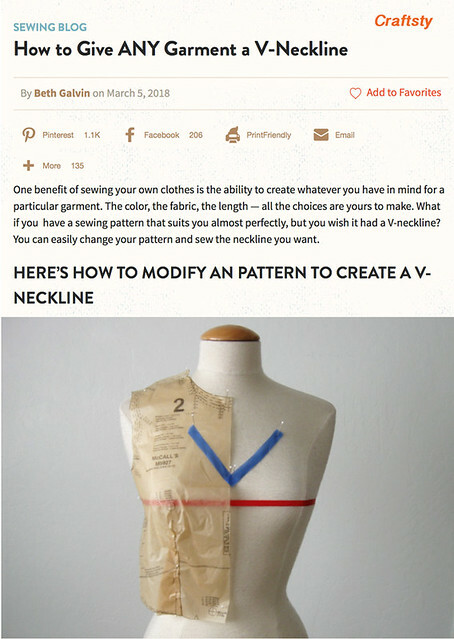 The next one is How to create a V-neckline on any pattern. 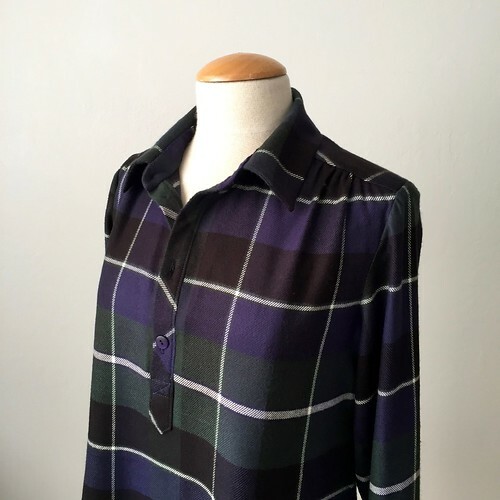 I think this one is useful as I find that often we have a TNT pattern but want to make it look completely different, and an easy way is to change the neckline. Like I mentioned above, lately I'm all about the pattern adjustments and with that in mind we are offering this class - I posted this on Instagram so figured I would repeat it here. I think this class will be a good fit ( ha ha, pathetic pattern adjustment pun) for you if you are new to fitting paper patterns or find the options and calculations of FBA's etc. to be a bit overwhelming. I'm going to go through the variety of adjustments and everyone will do them - paper doll style on sample templates so you can really get the process. And April 14-15 we're doing the Jacket Weekend class again. 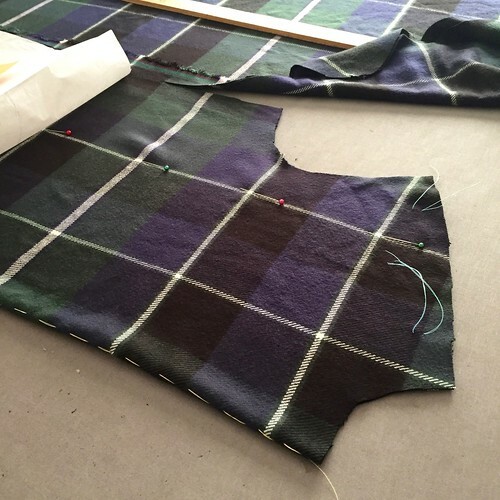 This session will be a lot of demonstrations and time to practice things like welt pockets, seam grading, pressing, crisp collars and hand stitching. 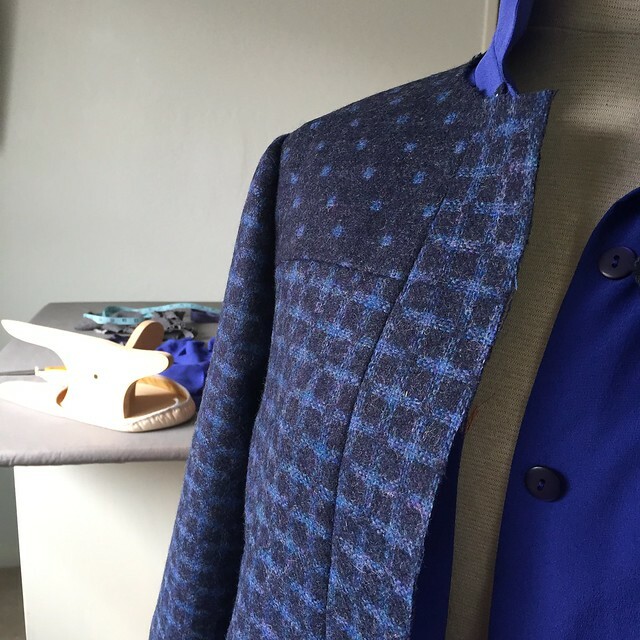 I know my taste tends to the classic but you can use any jacket pattern in the class, the techniques apply to most any project or future jacket you will make. Check out the Hello Stitch website, the specific classes might be a little difficult to locate so try the calendar view which will take you to the specific class. Or email me if you have any questions. And I'm also doing the Knit t-shirt class (this one is the most popular) Pattern fitting, my new favorite class: How to Read a Pattern and a summer dress class. Hope to see you at one of my classes. As to what I've been sewing lately - here's a sneak peek of what I'm working on. And plan to finish this weekend. I bought this wool fabric at Mood in NY in 2016 and have been searching for the perfect pattern to use that double sided wool. I'm so happy with the choice and will have a new jacket to show soon. The silk blouse was finished ages ago but I haven't hemmed it as I was waiting for the jacket to be completed so I could decide on the lengths of both. Sometimes you see a sewing pattern and know you must make it. 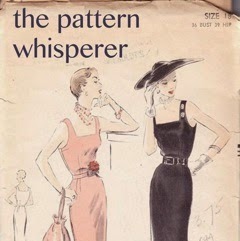 That's how I felt when I saw a BurdaStyle pattern last summer, I immediately told my friend Heather that I had the perfect pattern in mind for the next time she needed something in the formal/cocktail dress category. The result was fantastic and I told her I want to make another version quickly while I still have all the little adjustments and customizations fresh in my mind. A denim sleeveless version for summer is my suggestion, maybe a charcoal grey/black. But time to talk about this version. And for those of you who like sewing and construction details, there will be plenty. Usually I like to write longer posts and ramble on but today will be lots of photos with fewer words. My to-do list for the weekend is way too long and tomorrow I will be at Hello Stitch Studio all day, teaching a zipper class in the morning, a couple of private lessons mid-day, a Bay Area Sewists Meetup in the the afternoon, and if time permits a stop at Stone Mountain Fabrics on the way home. 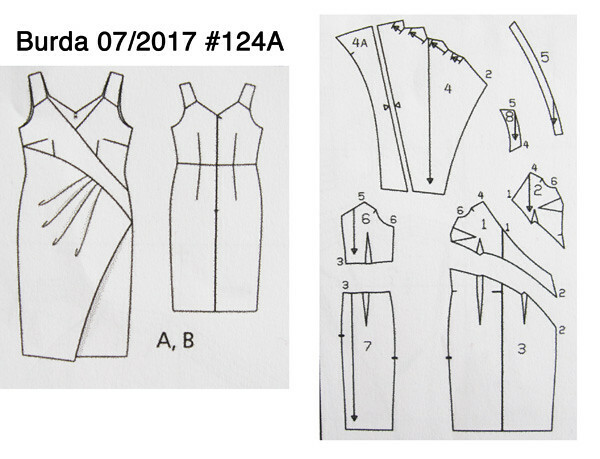 The dress: BurdaStyle 07/2017 # 124. 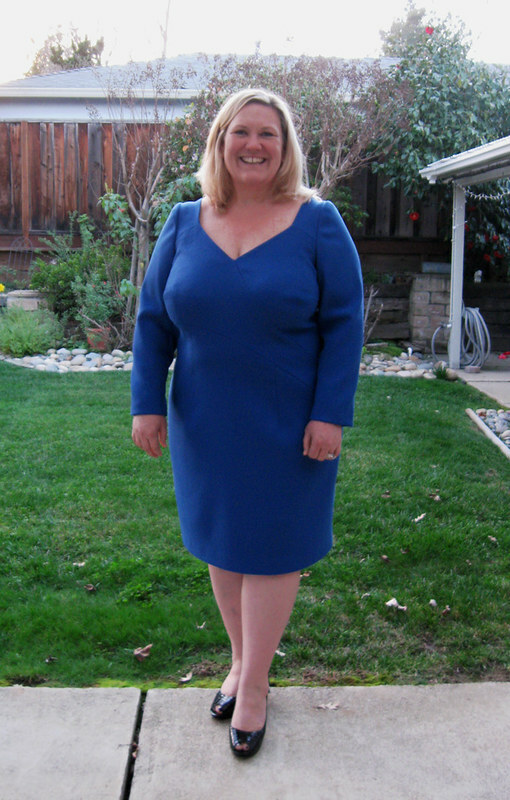 The fabric is wool stretch crepe (labeled Oscar de la Renta) from Mood Fabrics and it was sensational to sew. Just a dream fabric and the color was gorgeous as well. Really exceeded my expectations and at $ 30 per yard seemed a bargain for the quality. When Heather and her daughter came over to pick up the dress and the Hemisféric coat (which I previously posted) the sun was rapidly setting when we took pictures. I have adjusted the brightness in the various photos so the details are visible and thus the color looks different than the real thing. The BurdaStyle website photo has the model sitting down, actually kind of lounging which looks very elegant and seductive, but is not great for showing how the dress actually looks on a real person. 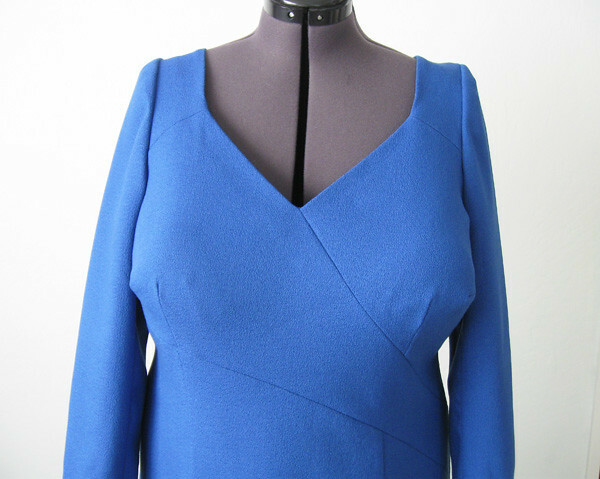 But no matter - that neckline and seaming was enough to convince me. This is a Burda Plus pattern, so European size range 44-52 which roughly translates to bust measurements of 39 inches to 50 inches. Technical drawing and the pattern pieces. Obviously a couple of substantial changes, I omitted the front drape, which was nice in theory but in reality was a bit bulky. The dress bodice and neckline have enough glamour that we felt it was a bit much in terms of design details and opted to make it a sleeker look. And then of course sleeves. It's winter after all. So she wanted sleeves and I would too in a wool dress to wear to a evening event in February. This one definitely goes in the category of advanced or complex patterns, with both the sewing and the fitting requiring a good amount of attention. Above are jus a few of the pattern pieces. I've made a number of Burda patterns for Heather and I think they are really great (my fav being this one). Do you know this phrase "there's nothing like a convert"? Used to describe someone who became a Catholic prior to marrying into our family. Implying their enthusiasm is perhaps a bit more fervent. Lately that's how I feel about Burda - since I am a recent convert to using their patterns. I find they have a really good selection of different patterns and their plus size patterns are outstanding. 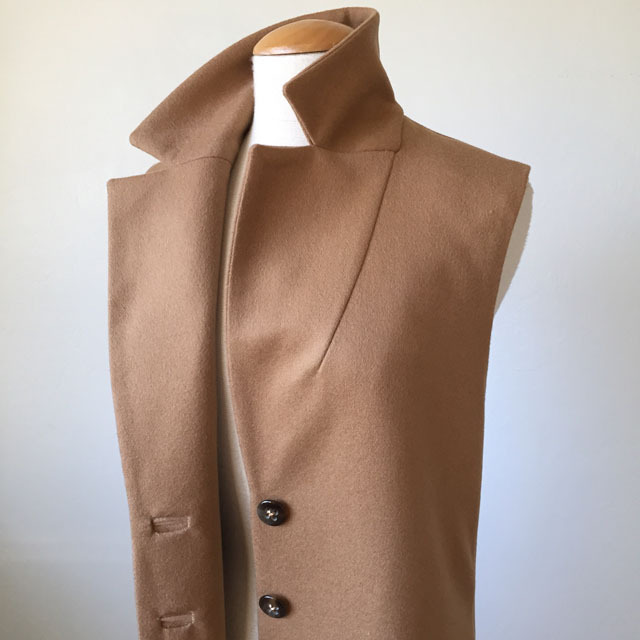 Sure, they have the typical number of goofy things that look ridiculous on anyone as all pattern companies do, but for garments with details, tailored separates, jackets and coats, the selection is great and I am always telling students to check out Burda. Sewing details: here's a look at the dress on the form, probably mostly basted together. I never take out the tailor's tacks threads until I'm mostly done, it's not a problem to leave them when you stitch and then I feel like if I need to make any fitting changes my roadmap is still there. She has narrow shoulders and a full bust so that can be tricky for fitting. So many women tell me that if they buy something that fits in the bust it can be swimmingly large in the neck and shoulders. And that's why we sew - to make what works and fits nicely. Since this dress actually was designed to be sleeveless the relatively narrow shoulder straps worked in favor of a good fit. 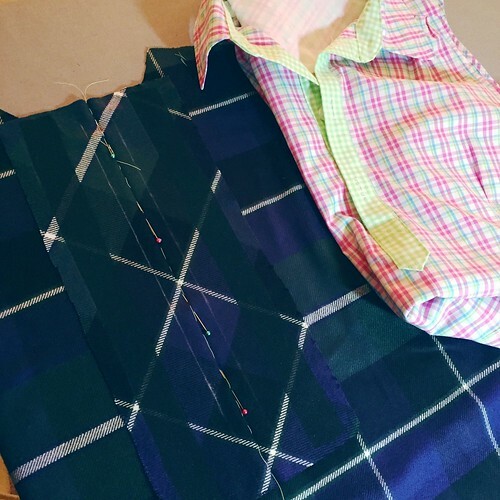 You probably know my sewing motto: More Interfacing! here's a side by side look at some of the places I added interfacing. 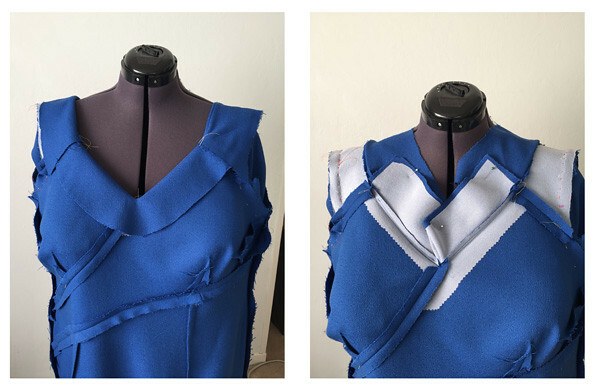 Left is the garment neckline facings, right is with the facings flipped up so you can see that both the dress edges and the neckline facings are interfaced, it makes the edge of the V-neckline hold its shape well. Also the strap area, interfaced on the garment side. 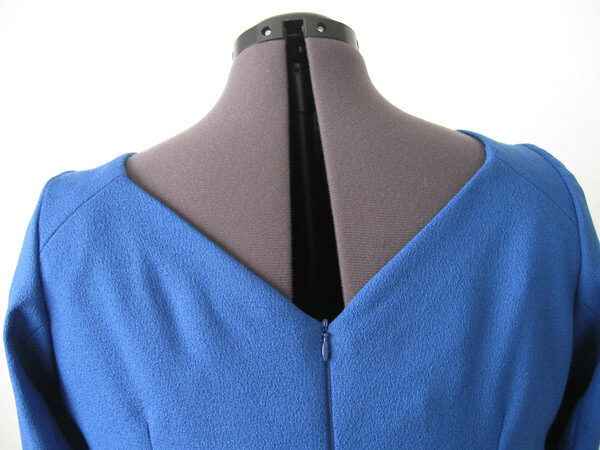 Similar interfacing on the back neckline. I'm really happy with the fit in the back as well. We lowered the V in the back, about 2 inches lower than the original pattern. 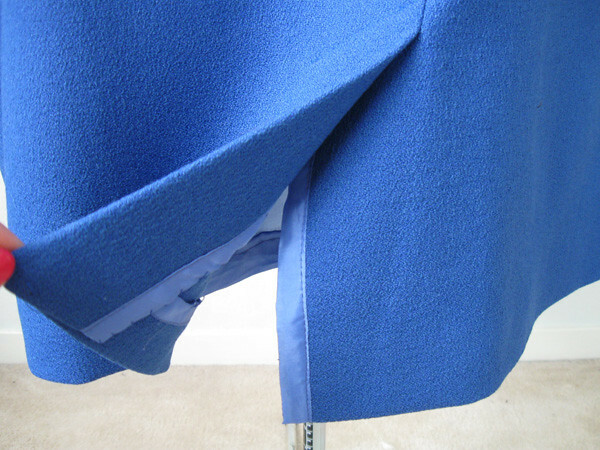 Also with those inside of the dress photos you can really see all the seaming and darting. I wish I had taken a picture during the muslin stage but was too busy actually finishing. I might try to add some of the adjustment info in an upcoming post as you might not believe it but I raised the center V in the front about 1 inch. Not an exercise for the faint-hearted. As that involved redrawing the angle of the seams and making sure the bottom of the V remained in the exact center. And I also took out some gaping across the upper chest. This was an epic project in the fitting stages but it paid off in the end. Sleeves - a slight challenge. 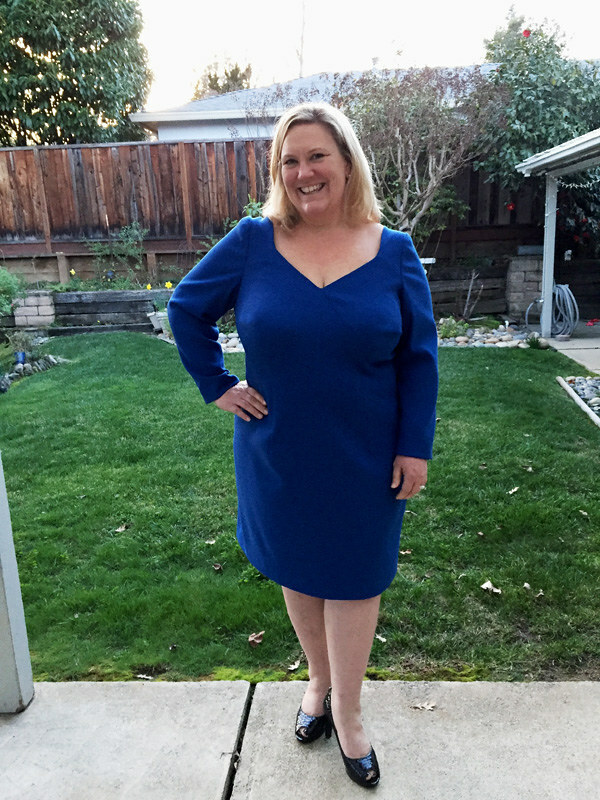 I actually used a sleeve from a Butterick pattern that I had which was standard two-piece sleeve, measured the armhole circumference on the dress and then made the sleeve match, plus fit her comfortably. It has minimal ease which I think looks quite good and results in a very smooth sleeve cap. Plus this fabric has a touch of lycra so the sleeve armhole and the dress armhole could be very close in measurement and still be comfortable. We played around with the sleeve length but decided that long sleeves looked most elegant. Getting dark when I took this photo and the flash went off - which actually makes the seaming visible. Now picture this dress with the pleated overlay - just too much fabric and not as sleek. Although in a silk or other light fabric it would be very pretty. I never put in the zipper until I have the final fitting worked out. 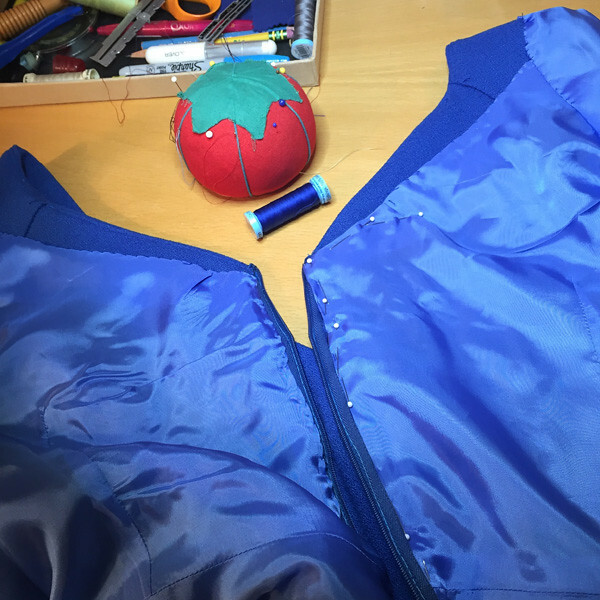 Then I pin fit the garment on the body, mark a line of pins where the stitching of the zipper should be, then run a thread trace on one side. That way I can put in the zipper later whenever it's convenient. And sometimes the top of the zipper comes out perfectly :) why doesn't this happen every time? but I'm glad this one did. When it comes to linings I like to wing it. 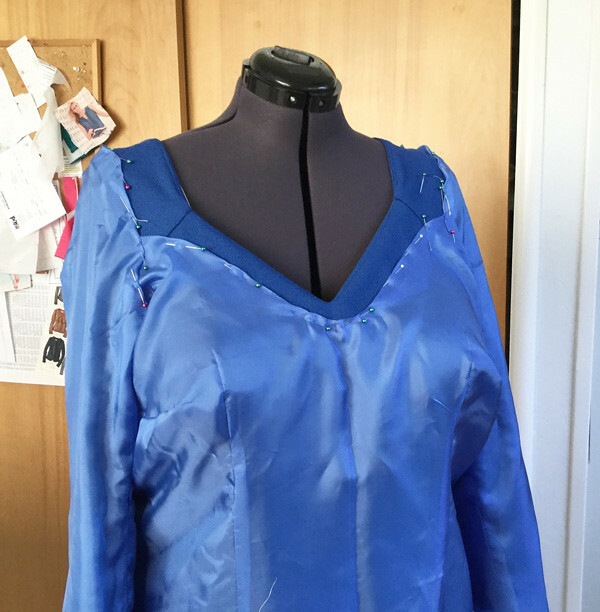 I created a front lining piece by overlaying the front pattern pieces together and including the vertical and horizontal darts to make a one piece, cut-on-the-fold front lining fabric, and then for the back and sleeves used the regular pattern pieces. 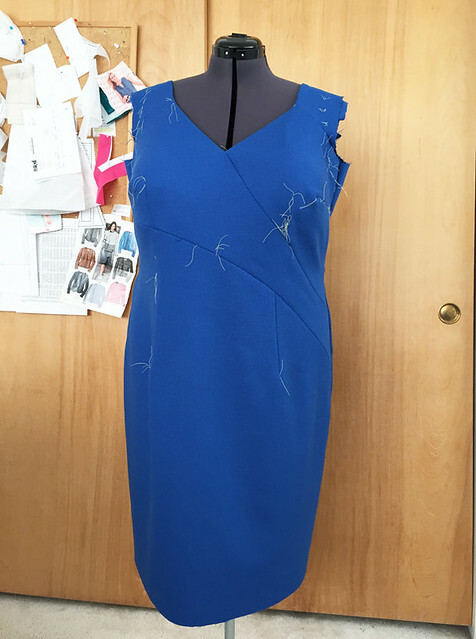 I sewed it mostly together on the machine, and then used the dress form to pin the lining in place, folding the top edge over and pinning. I hand stitched the lining into the dress, which gives so much better control and placement. 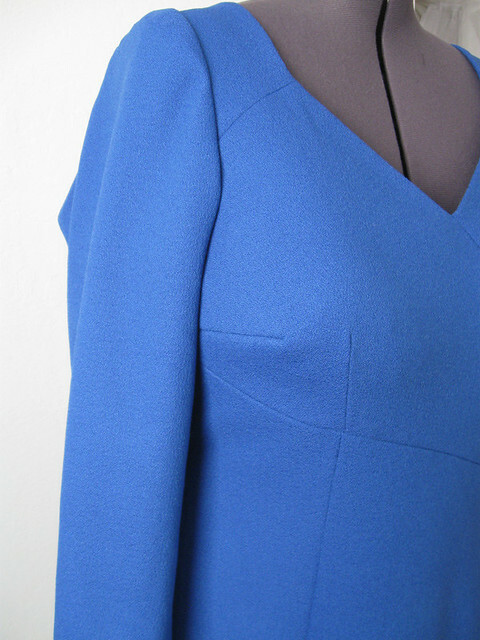 Also I had tacked down the facings where possible to the seam allowances so that neckline is not going to shift at all. For the edges of the walking vent I end up encasing the edges in the lining fabric, and did the same for the bottom hem edge. Heather called this her bombshell dress and I agree - she looks fantastic. I kind of wish I need something similar just for the fun of making it. But no fancy events on my calendar right now so it will just have to be an idea saved for later. Time to get back to my to-do list, the day is ticking by and we lose an hour tonight. But I'm not complaining, more light in the evening, spring is just about here, hurrah! Up next, I have been trying to make a jacket with some wool I bought at Mood in 2016, the plan is all figured out, I just need to get started. I've been sewing some Bondi dresses from Tessuti patterns as we are doing a dress class in April at Hello Stitch. 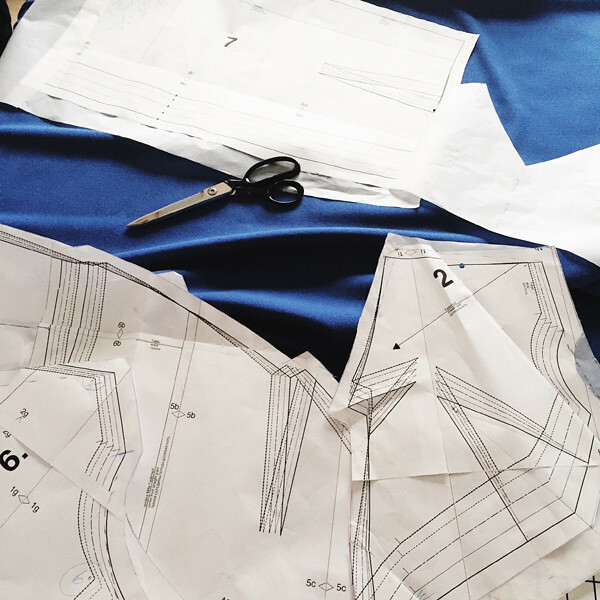 We will have all the sizes sewn up so you can try on and figure out what size to sew before cutting into your fabric. Good idea, right? 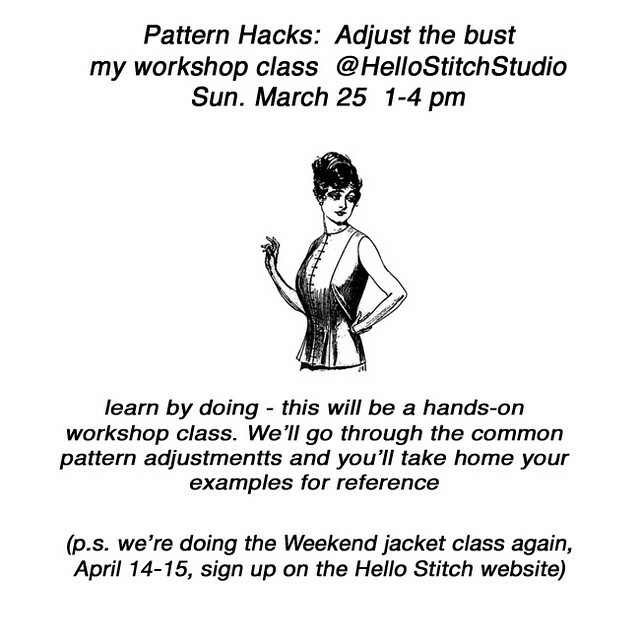 Also on May 25 is Pattern Hacks: Adjust the Bust which will be a hands-on pattern manipulation class where we will go through all kinds of bust adjustments on pattern templates. 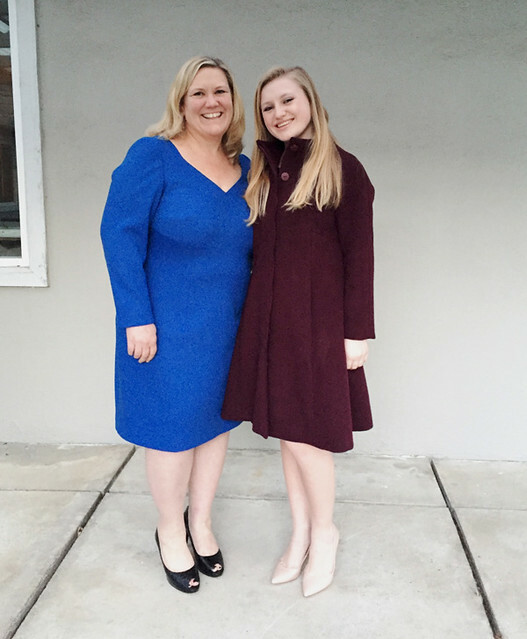 and one more of Heather in her Burda dress with Sara in her Pauline Alice patterns Hemisféric coat. One more reason I like to sew with wool - the colors are so beautiful. Are you watching the Academy Awards? As I write this blog post I'm watching it and thanks to the DVR we recorded and then can skip through all the commercials - a necessity. Being in the same time zone makes it convenient cocktail hour viewing :) Some fantastic dresses this year and lots of great colors. 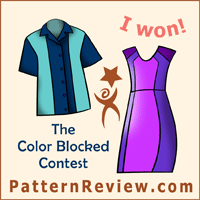 By the way - update on the drawing for some patterns I did in a recent post. Last week I posted the names drawn and none of the 3 people contacted me. Strange! and unfortunate for them. Never happened before. So it's been a full week and I think it's time to draw new names, which I did. Details at the bottom of this post. Here's something I started back in January and while it has a few flaws it's warm and nice to wear in what passes for a cold snap around here. 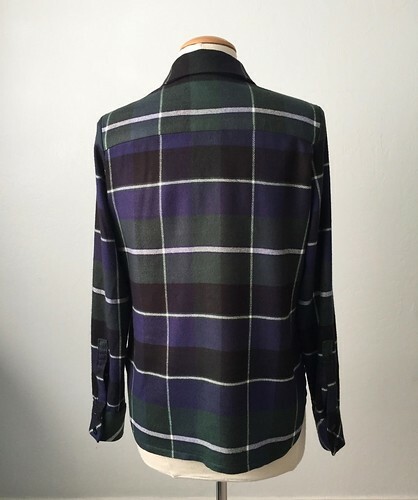 A new flannel shirt is something I've been wanting and I happened to see this fabric at Joann's one day, it was on a super discount but surprisingly soft and good quality. 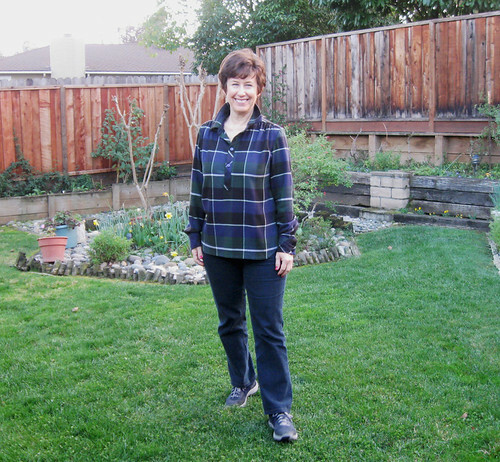 I decided to make it a popover shirt with a loose shape. 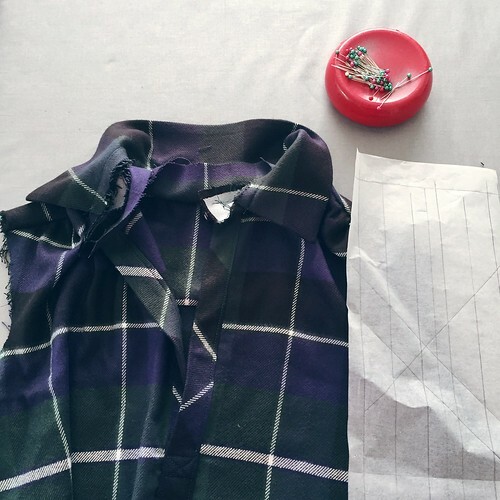 For all shirts I start with my basic shirt pattern and modify it to change the details. 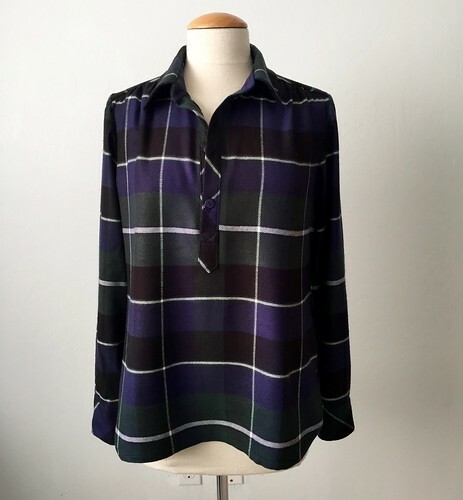 For some reason I thought the placket would be nice on the bias - however after it was done I can see that the plaid is kind of big and it doesn't really look great. I think matching the plaid and cutting on the straight grain would have been much better. Oh well, all done. 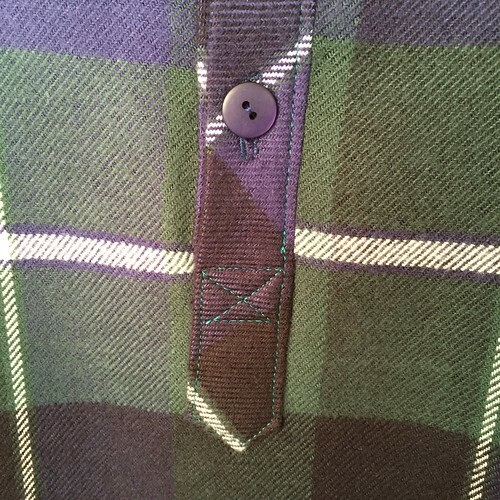 Here's the placket piece stitched on the front of the shirt. I put the pink shirt next to it to show what it looks like when finished. A while ago I did step-by-step instruction on the Craftsy blog, here's the link . Placket finished, and the collar band attached. That's the placket pattern piece. and I even messed up the alignment a bit at the bottom. Although the stitching came out quite well. I blame sewing while sick! I should have just stayed on the couch watching movies. But reasonable matching across the yoke. That's the part I should have put on the bias, which I usually do with plaids. Sleeve matching is OK, although there are thin and thick white stripes and that is also not lined up but now I'm nitpicking, right? So onward to better projects. Which are so numerous, slightly getting out of hand the number of things I have in various stages. And I used to be a one sewing project at a time person - not any more. Hope to hear from each of you. And now I have to dash - time to get some of the aforementioned projects finished. And possibly get some stuff done in the garden - but I am a weather wimp - the temperatures are in the 40's-50's ℉ which for us is positively arctic and too cold for me to get out there for weeding and planting. I know - so wimpy! Although when it is 110℉ in the shade in July I might miss it. 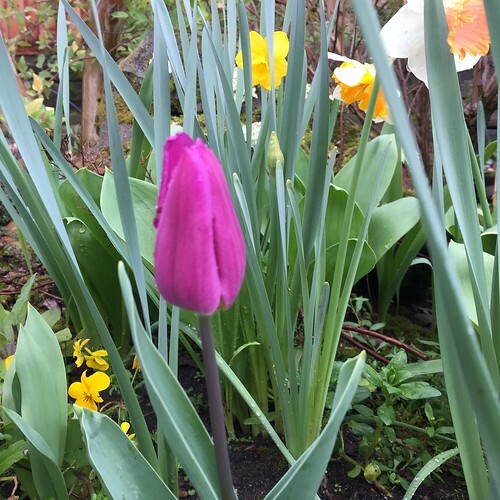 and despite all my moaning and groaning about winter (my apologies to those of you in the snow zone) but look what I saw today in the flower bed. Yep, the first tulip and what a gorgeous color. Beth, of SunnyGal Studio, a custom dressmaking and design studio. I create unique, custom fit clothes for my clients and a few new dresses for myself. I love to sew almost anything, formalwear, tailored jackets, children's clothes, vintage styles, and clothes for travel to sunny places. When I am not sewing I work in my garden and obsess about the weather. Follow Beth SunnyGal Studio's board Pattern Recommendations on Pinterest. Qu'elle est verte, ma Terre Adélie ! Modelage, photos, illustrations et cie.